As Dennis Prager points out, most of the country considers themselves either on the right or independent but the left has become successful by capturing the mainstream media and Hollywood. Personally, I would add university professors into the mix. As Prager points out, the recent Arizona shooting shows the left will routinely lie about the right and change the subject when caught. Those people who watch the media objectively see the reality before their eyes and it seems finally, others are learning about how a newspaper like the New York Times uses its elevated position to assign blame to the right whenever possible - especially it seems when unwarranted. I am not a financial expert nor am I an economist – but considering they all have missed virtually every significant financial event from the dotcom bubble to the telecom bubble and the housing bubble let’s just say not being an economist or financial expert probably is a distinct advantage. Having said this, I would like to discuss a few issues which need to be out in the open and discussed before the new Congress begins. Banks do not keep all of their assets in cash meaning if the majority of a bank’s customers decide to withdraw all of their money at the same time, the bank collapses. Think about it – they loan much of the money they have to others and don’t have access to it all. When one bank collapses there is a chance other investors will get spooked and create a cascade of bank failures. When not stopped, you have the potential for another Great Depression. To date, bank runs have been stopped because governments around the world have been able to stop them by assuming the bad loans the banks have made. With all the debt global governments have amassed, there is a possibility at some point that investors will start a global bank run meaning county after country will see their banks collapse because the confidence in the ability of a country to pay back its debt has plummeted. CNN invented the 24x7 news genre and in the last ten years has found its market share dropping against Fox News and more recently MSNBC. According to Larry Kramer the reason has to do with time. People don't have time for all the analysis he says so they gouge their opinion based on what MSNBC or Fox news says about a particular situation - like a new Supreme Court Justice nominee. The idea according to Kramer is less time = less patience to do the homework ourselves and we allow others to do it for us instead. While I am no expert on MSNBC - I watch it only occasionally, it is worth pointing out that Fox News makes a major effort to present all sides to a story. The wonders of Obama - we all get a tingle down our legs - just like Chris Matthews. If you graduated college and live in the DC area you are less than half as likely to think Sarah Palin is qualified to be President. So says a Politco poll which is full of useful information which shows fairly consistently that Washington elites are somewhat if not totally disconnected from the rest of the population. Consider that this month, 38% of the DC elites think the economy is headed in the right direction but only 26% of the general population believes this is the case. The recent press conference where President Obama tried to sell tax cuts for those making over $250k while extending unemployment benefits for 13 months struck me as being odd but until I read Peggy Noonan's article titled From Audacity to Animosity, I couldn't understand what was so perplexing. Instead Mr. Obama said, essentially, that he hates the deal he just agreed to, hates the people he made the deal with, and hates even more the people who'll criticize it. Without the US government pushing subprime loans for home purchasing which by definition are a risky product, there could be no start to the subprime housing bubble which eventually burst. Countless government agencies have been involved in the mortgage business for decades such as Fannie Mae and Freddie Mac and laws such as the Community Reinvestment Act over time held banks accountable by forcing them to lower their lending standards so as not to charged with unfair lending practices. In other words, if the government over decades and through both Republican and Democratic administrations did not get deeply involved with ensuring people with poor credit were getting loans, we would not have seen a sub-prime housing bubble or a bursting thereof. This doesn't mean home prices wouldn't have corrected - we have seen many corrections over the years but this one would have been much milder if the government wasn't standing over the banks ready to call them racists and charging them with crimes for not lending to minorities who tend to have lower credit scores. John Carney has an incredibly well-researched article on the topic and it should be read by anyone who does not want to see a repeat of the housing collapse. Rather than looking at the real roots of the problem, the government has done an amazing job blaming Wall Street and just about anyone else they can find for the problem. Sure Wall Street played a role but the major distortion in the market came from the government and it amplified the pain of the crash because it amplified the rise in prices. The facts are crucial to understand as the AP just reported that HUD is investigating mortgage lenders who require better credit scores than the government requires to get a mortgage. The issue they have is that minorities have lower credit scores and are subsequently not able to purchase as many homes. There is no charge of discrimination based on race mind you but just on credit score. The policies have "the effect of discriminating against African–Americans, Latinos, and residents of African–American and Latino neighborhoods across the nation," the National Community Reinvestment Coalition wrote in the complaints that it announced Wednesday. A lot has changed since the days of the old, Wild West. Guns, after all, are passe. It’s technology that rebels are going to need to be slinging if they want to fight the big, bloated beast that is the state. Polished, at the hip and at the ready… brains are the new firearms. And "firearms" are desperately needed because of how this country was founded. In rebellion. Rather than seeing the Tea Party as what it is - a massive grass-roots movement initiated by Americans who are fed up with large government and re-distributive progressive ideals which end up hurting the very people they are supposedly helping, Dean once again plays the race card saying the Tea Party is uncomfortable with the current demographic shift in the US. Dean does not let facts get in his way of course - totally ignoring that the Tea Party just elected more minorities than Democrats - instead, he goes on to show that the only thing less coherent than his screaming is his rambling. While racism was often used to discredit the Tea Party in its early days, sane people have come to the realization that there are likely the same number of racists in the Tea Party as any other group of people such as Democrats or Republicans. But rather than debate the merits of his arguments - for example, how can he explain taking more money from the private sector which is currently used to create jobs will create more jobs? Morover, if most people start or grow new companies because of the potential to become wealthy, how can lowering the amount of wealth a person can achieve, increase the rate of new business creation and subsequently job creation? Other arguments you will see Dean avoid are how can placing any able-bodied person on government assistance for many years or decades make them a productive member of society enabling the US to compete effectively with our new competitors in China and India. Moreover, has anyone ever seen him address how borrowing money from countries with terrible human rights abuses - ones we don't consider allies, enables the US to negotiate for better rights in such countries? No, for Howard Dean, the argument is that the Tea Party is racist and Republicans are bad because they believe that everyone should have the opportunity to succeed and by providing society with maximal opportunity, they have the maximal chance of becoming self-sufficient and potentially wealthy. Moreover, conservative principles achieve something no Democrat wants for the poor - the dignity of being able to provide for themselves - free of the need for government assistance. America continues to be the land of opportunity and hordes of immigrants come to the US every year to escape large-government and/or religious/racial/class oppression, in order to start companies or work in other roles which help provide jobs for countless others. Yet Democrats conveniently ignore the fact that someone with English as a second-language but the desire to make it to the top can come to the US and become incredibly successful. And they discard the fact that this happens regardless of race, religion or sexual orientation - in the US - we truly (for the most part) judge you based upon your character, knowledge, skills and ability. If anyone is expecting civility in politics in the next two years, this demonstration shows you likely won't see any. Here's what happened according to CBS News: Buyer this afternoon asked Democratic Rep. Laura Richardson of California, who is acting as speaker, to yield time for him to speak on a veterans bill. Richardson refused, prompting Buyer to ask sarcastically, "as a sitting member of the House, the speaker chooses not to recognize another sitting member, is that correct?" 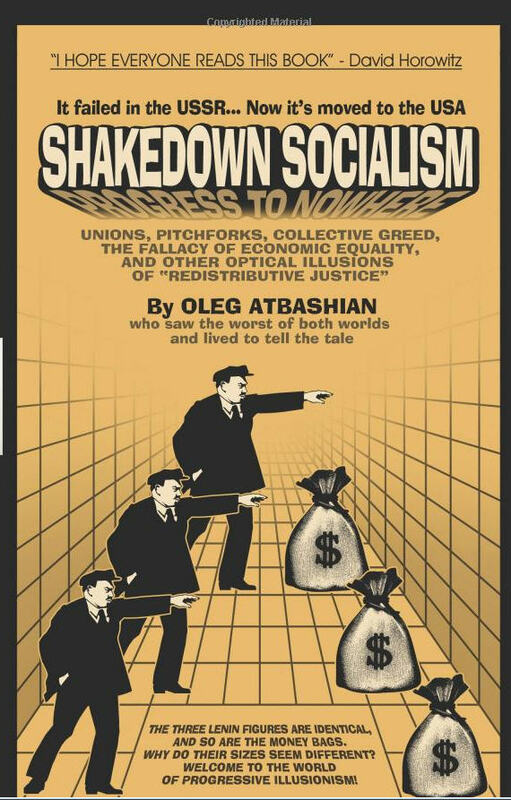 Oleg Atbashian of shakedownsocialism.com joined Alexis Garcia of PJTV to discuss his childhood in Russia where communism was painted as an ideal way to live. He later realized it wasn't - unless of course you like to stand in line for hours to get a loaf of bread - or be slaughtered by your dictator (benevolent comrade communist party leader). As a Russian immigrant, he is ideally suited to write a book called Shakedown Socialism which details his concerns that the US is headed down the path towards socialism. He says he can't believe he would have to write anti-socialist and anti-communist documents here in America - and frankly we are pretty surprised that the country has gotten to this point as well. One of his points is that journalists seem to be obsessed by how much other people make. Moreover he equates unions with communism - as they both espouse redistribution of wealth and "fairness". Not surprisingly, President Obama has been on record time and time again as a huge proponent of the idea and his policies are in lockstep with his words. At one point in his interview he mentions the famous Margaret Thatcher quote, " The problem with socialism is that eventually you run out of other people's money." This quote is especially relevant as country after country in Europe is really running out of other people's money before our eyes. Other important topics in the book include all the red flags (pun intended) which are going off as a result of analysis of Obama's foreign and domestic policy. Today, President Obama proposed a freeze on federal pay for specific workers for a period of two years and we are left wondering why. After all, the President has said repeatedly that we need the public sector to get the economy "back on track" because the private sector cannot. So if we cut spending in the public sector or at least cancel scheduled increases, does this mean we are acknowledging that the private sector is better equipped to get the economy moving? Or is this move just a ploy to take steam away from Republicans who will be taking control of the House and pushing massive cost-cuts. We believe that Obama has not found religion on the issue and is trying to reduce the amount of credit the Republicans will get for future cost-cutting in the next election. Moreover, he will now be able to make it seem like he cares about deficits and being fiscally responsible. We hope of course that we are wrong and that Obama has decided to become fiscally conservative but this would not be consistent with the plurality of his speeches and actions. But from a political standpoint, it is a smart move. In the mean time, it is worth reading two recent articles in the USA Today on government versus private sector compensation. One discusses how many government workers make over $150,000 per year and the other discusses how federal wages and benefits are double what they are in the private sector. Based on this information, wouldn't it make sense to announce federal pay cuts - not just a freeze? The Onion has a funny take on the turkey pardon by President Obama. Happy Thanksgiving everyone.